123D Design by AutoDesk is a free, consumer 3D modeling program. It is available as a web app, for your iPhone and iPad, and as a download for your PC or Mac. This article is specifically for the downloadable version of 123D Design. 123D Design is one of the more intuitive consumer modelling programs we’ve used. The very best way to learn the software is to download the program, get your hands dirty, and see what you can create. Autodesk has provided some video tutorials that are a great way to get started. We’ve outlined the basic functions of the software below. We’d also recommend importing a 3D file to give you something to start with as you get used to the software. Left Click - The left click will select an object. If the object selected is a surface, a tool icon will appear. From the tool menu, you can Tweak, Push/Pull and Shell the surface. Center Button Scroll - Scroll the center button to zoom in and out. Center Button Hold - Click and hold the center button to pan. Right Button Hold - Click and hold the right button to orbit. New - Opens a blank project. Open - Opens a created project. Insert - Inserts an object into a current project. Save… - Saves your project file To My Projects or To My Computer. Save a Copy… - Saves a copy of your project To My Projects or To My Computer. 3D Print - Exports your file directly to your 3D printer or you can save your file and send it to a 3D printing service. Send To- Sends your creation to 123D Make, a CNC Utility or a 3D Printing Service. Create 2D Layout - You need a Premium Membership to use this feature. Export STL – Exports an STL file of your design. You can use the STL to print a model at home or send it a 3D Printing Web Service to be printed. Exit - Exits 123D Design. Undo - Undoes the last action. Redo - Redoes the last action. Transform - Moves and scales an object or the surface of an object. This is also used to rotate an object or surface. 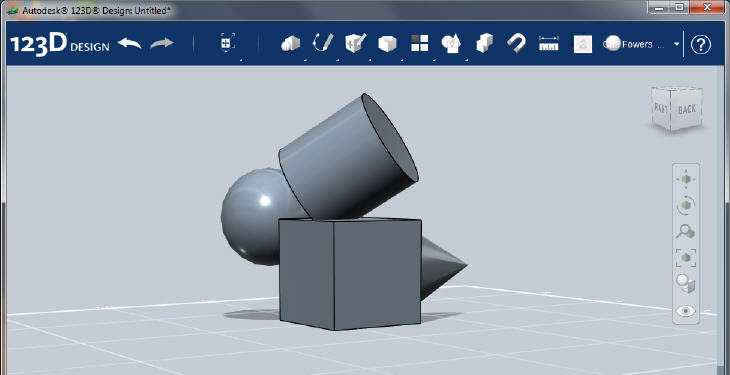 Primitives - Inserts primitive shapes into your model such as boxes, spheres cylinders and cones. Sketch - Draw shapes and lines in your model. Construct - Includes the Extrude, Sweep, Revolve, and Loft tools. Modify - Modify the shape by pressing, pulling, tweaking, splitting and more. Some of these options are also available when you left click on a pane and click the tool button. Pattern - Creates a pattern by copying the object multiple times. You can also mirror your object with this tool. Grouping - Gives you three options: Group, Ungroup and Group All. Grouping allows you to move and resize shapes as a group. Group All groups everything on your canvas. Ungroup ungroups selected grouped objects. Combine - Combines two intersecting shapes into one body. Snap - Snaps one shape onto the face of another shape. This tool also helps you center one shape on another. Measure - Measure the Distance, Angle, Length, Area, and Volume of objects. Material - Change the color and texture of objects. You can choose any color and choose from a variety of materials including metal, wood, carbon fiber and plastic. Account - 123D Design allows you to create an AutoDesk account that allows you to save your projects to the cloud and share your models with others. Once your model is saved to the cloud, you can move it into other 123D applications such as 123D Make. Help - Here you will find help options like Video Tutorials, Quick Start Tips and more. View - Allows you to easily change your perspective of the object. From the View menu, you can also choose to show Materials Only, Outlines Only and more. Online Kits - Add many other shapes to your model from a number of categories including Robot, Gadget, Hardware, Bicycle and more. Some of the objects are locked unless you have a premium account. These objects have a small key in the upper-right corner of the image. Units - Set the units you are working in (e.g. inches, centimeters and millimeters). Once your design is created, you can choose to save your design in AutoDesk’s cloud if you have an account. The basic account is free. You can also export your 3D creation to an STL file that you can 3D print at home. Another option is to send your STL file to a 3D printing service such as WhiteClouds.